A quick and cost effective way to get the Revit content you need. Our clients kept telling us how unhappy they were with the “Out of the Box” Revit families provided with the software. While our clients could develop families on their own, it would take an experienced Revit user away from their project for a significant amount of time. So we developed our Revit Family libraries with just the right amount of detail making them simple to use, and flexible enough so they can by adjusted to meet your graphic standards. Finally a quick and cost effective way to get the Revit content you need. 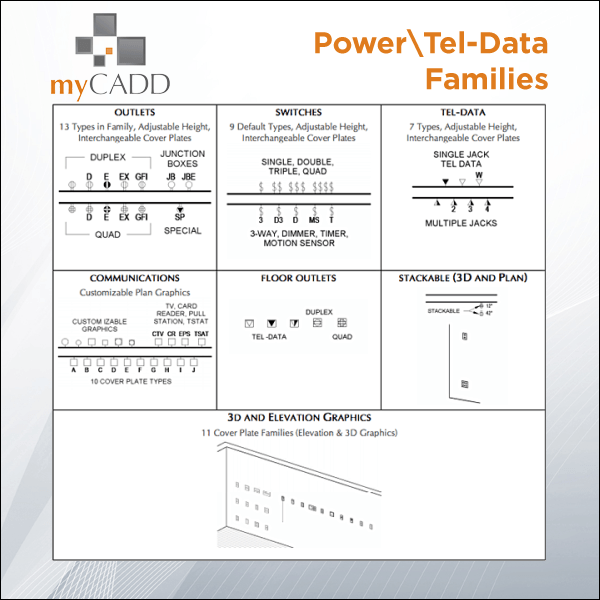 Replacement PowerTel-Data library with Non-Hosted families. Families are simple yet flexible and can be customized to meet your graphic standards. Looking to Increase Revit Productivity? Contains windows with 1 to 4 mulled units with parameters so you can easily adjust frames, mullions, headers, sills and interior / exterior trims. Base and upper cabinet families are “stretchable” so you can place long sections without having to worry about detailed design.. 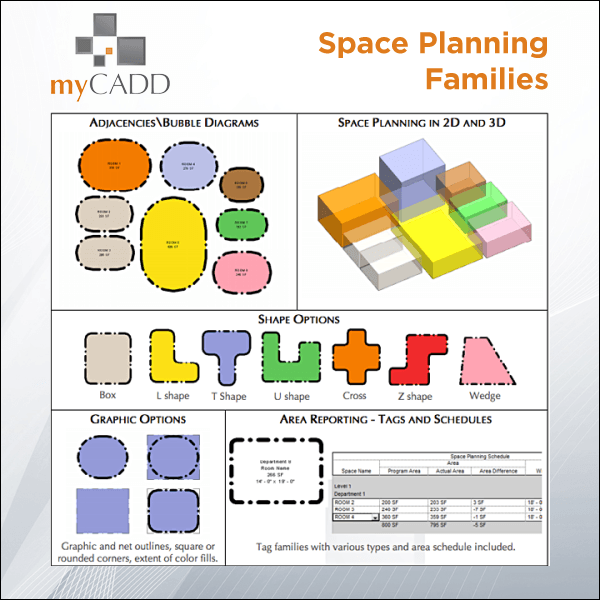 The Space Planning families allow you to quickly create colorized bubble diagrams and simultaneously track areas against your program. The Light Fixture Library is a collection of Revit families designed to provide the variety and flexibility which is missing from the default Autodesk libraries. Replaces the default “out of the box” door families. Designed to be easy to use while being flexible enough for almost any project. 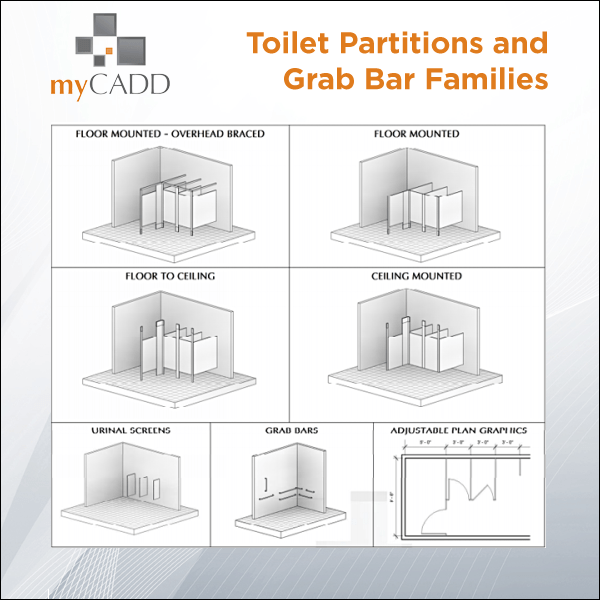 The default library included with Revit doesn't include Toilet Partitions and Grab Bars. Ours are designed to be flexible enough to represent products from any manufacturer. The default library included with Revit does NOT included Elevators. These families were designed to be simple yet flexible enough to represent products from any manufacturer. 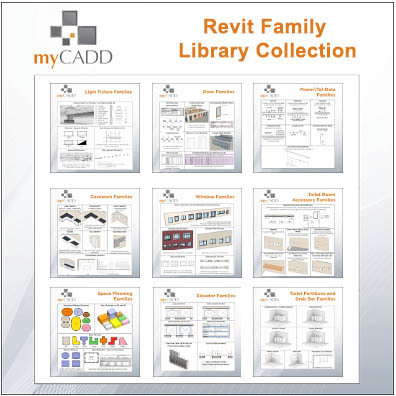 Purchase all 9 myCADD Revit Family Libraries and save 10%. The myCADD Revit Family Library Pack is a collection of Revit families designed to provide the variety and flexibility which is missing from the default Autodesk libraries. No need to develop your standards from scratch! 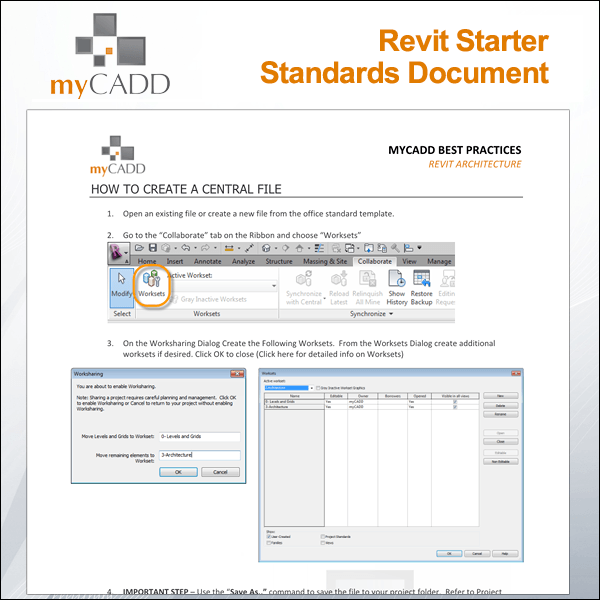 The "myCADD Starter Standards" documents address all the typical best practices. This family is an annotation symbol than can be easily placed in any 2D view to quickly make notes in a project. Text can be added in the properties palette or by clicking directly on the post it, text can be single or multi line. 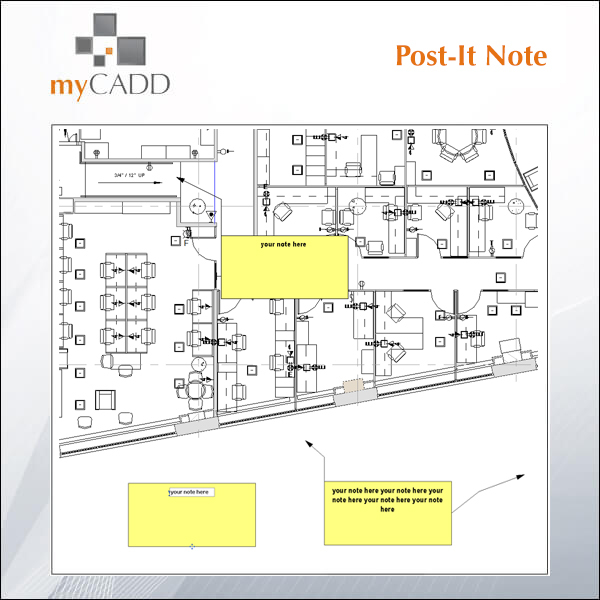 Height of post it is user controlled, and leaders can be added in the modify tab. 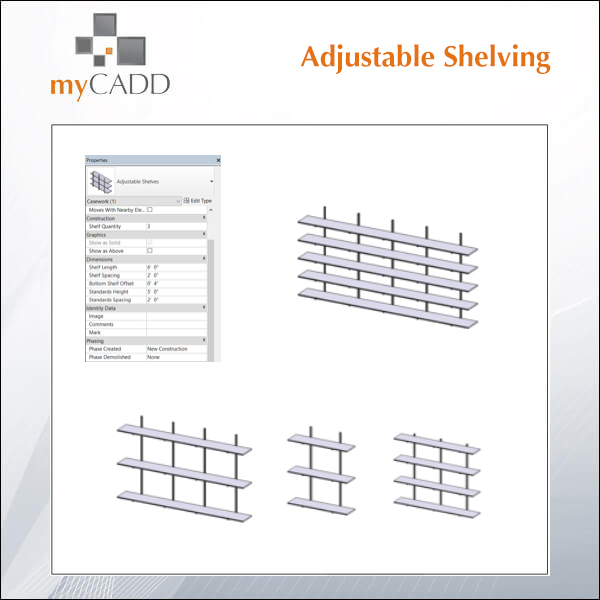 This is a shelving family that is user controlled through instance parameters so that the shelves can be easily edited upon placement without having to make new types. The number of shelves, shelf length, spacing, offset, and standards spacing and offset are instance parameters. The depth and thickness of the shelves and standards can be edited as type parameters. Snaps to faces, but is not wall hosted. 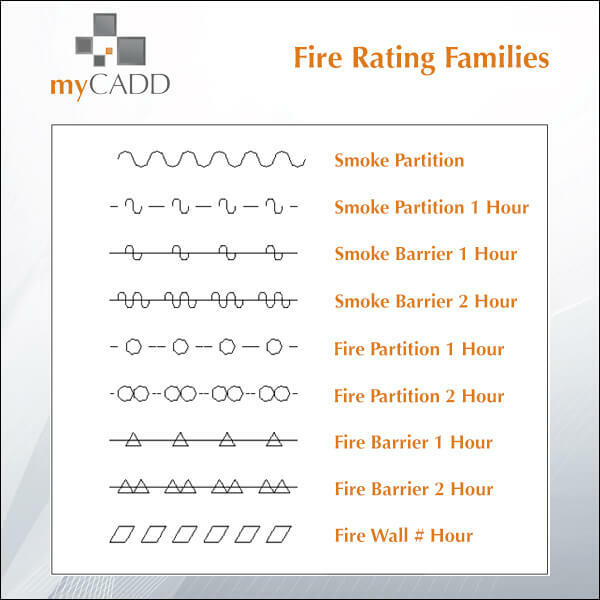 We were looking for a "more graphic" way to show fire rating lines, as compared to the traditional dash-dot graphics. In order to achieve that we built these lines as repeating details. The line weight and color are controlled by the Detail Items -> Heavy Line settings. The project file containing the families is in Revit 2015 format so they can be used in versions 2015, 16 or 17. There are many advantages to this approach. First it’s really easy to create the trim and place it exactly where you want in the model. The trim is not hosted by a wall, allowing it to exist with or without the wall and allowing you to place the trim on a “room by room” basis. This is a specialty equipment grab-bar family. It snaps to walls but is not a hosted family. When placed it defaults to 3’-0” above the associated level, an offset from the associated level can be added as an instance parameter. Offset from wall, length, and default mounting height can be edited as type parameters. 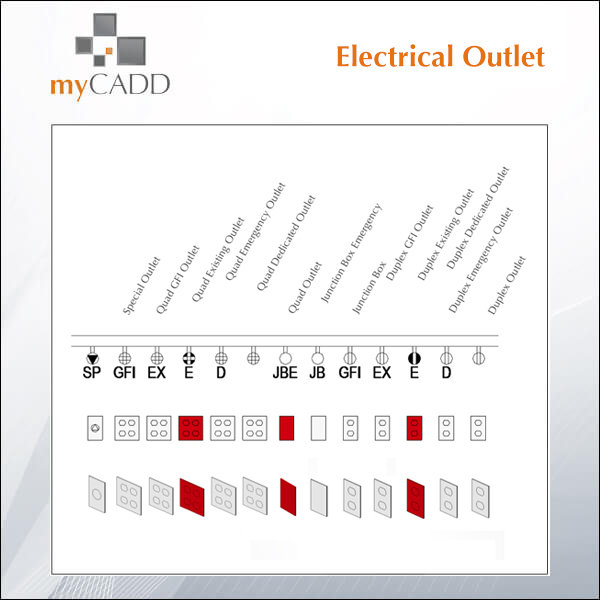 This is an outlet family that includes the 13 types below. Offset from floor, offset from wall (in plan), and side offset can all be controlled through instance parameters. We have built a replacement PowerTel-Data library with Non-Hosted families. The families are simple yet flexible and can be customized to meet your graphic standards. They contain multiple graphic options for plan, elevation and 3D. They include options to display plan labels or can be tagged. They can be stacked vertically and plan graphics adjusted appropriately. The cut plane for the families can be adjusted to control display in plan and rcp. 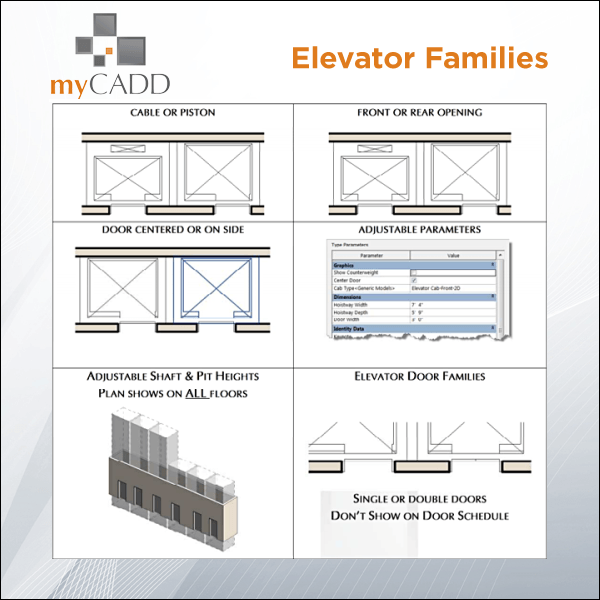 These families are intended for Architectural usage only and do not contain Revit MEP connectors. 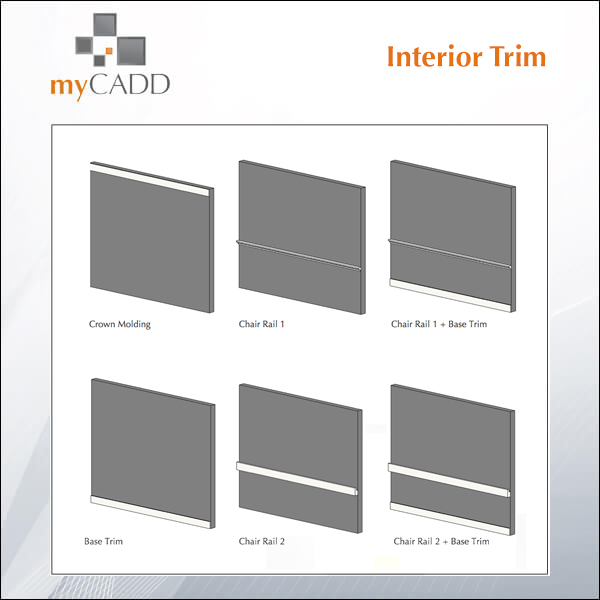 The myCADD Revit Window Library contains windows with 1 to 4 mulled units with parameters so you can easily adjust frames, mullions, headers, sills and interior / exterior trims. The are simple enough to use at the early stage of design but with enough controls so they can be used in CD's. The Space Planning families allow you to quickly create colorized bubble diagrams and simultaneously track areas against your program. The families are both 2D and 3D and can be easily converted to wall objects. 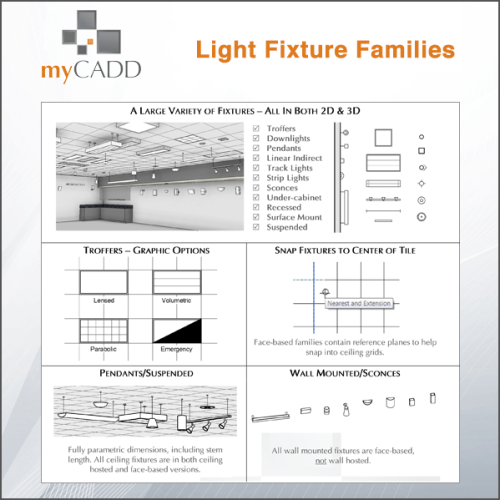 The myCADD Light Fixture Library is a collection of Revit families designed to provide the variety and flexibility which is missing from the default Autodesk libraries. They are flexible enough to meet your needs and designed to be easy to use. The ceiling fixtures are in both ceiling hosted and face-based versions. 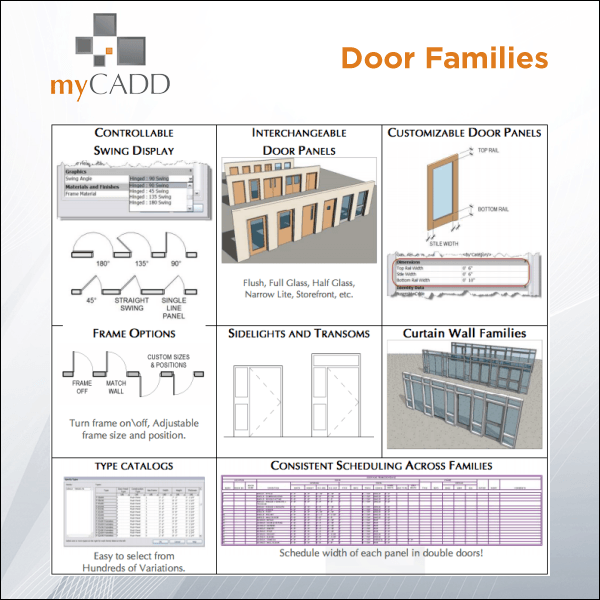 The myCADD Revit Door Library replaces the default "out of the box" door families. We designed the families to be Easy to Use while being Flexible enough so they can be used in almost any project. 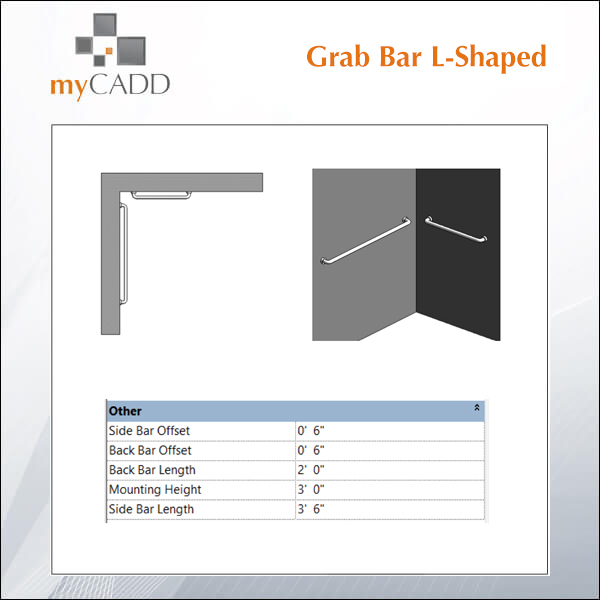 The default library included with Revit does NOT include Toilet Partitions and Grab Bars. These families were designed to be flexible enough to represent products from any manufacturer. 3 Toilet Partition Families - Door Panel, Divider Panel and Urinal Screen. 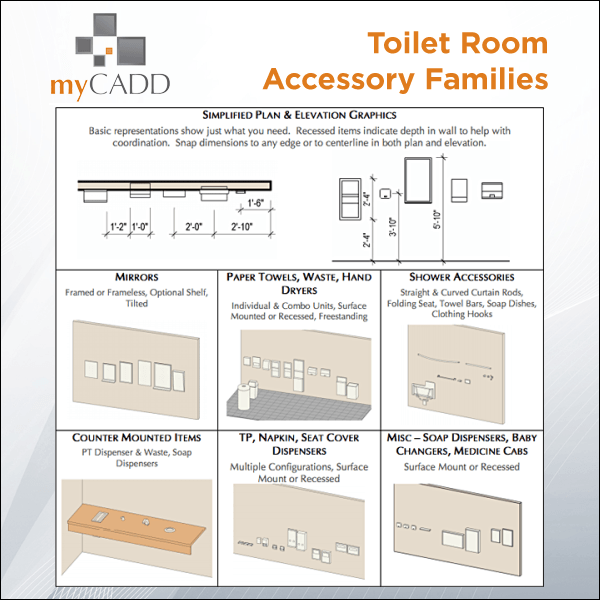 The Toilet Room Accessories Library includes all the families you'll need to fit up a toilet room. The families are "non-hosted" to make them easy to place, and to ensure they don't get accidentally deleted. They are lightweight and flexible enough so they can be used to represent products from multiple manufacturers. 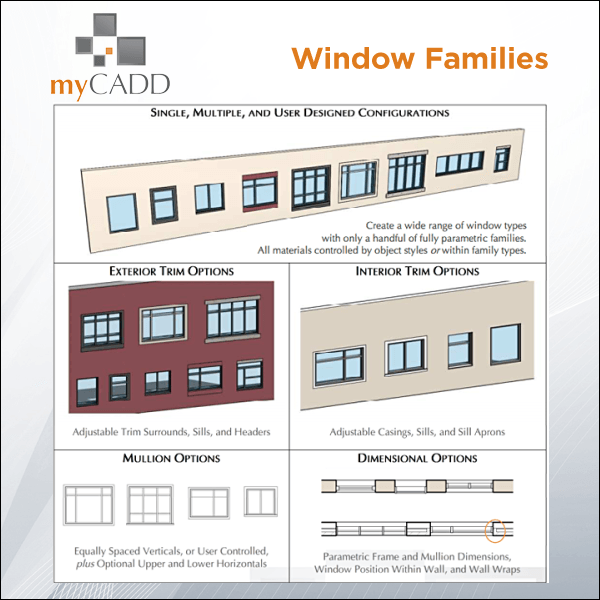 Purchase all 9 myCADD Revit Family Libraries and save 10%. 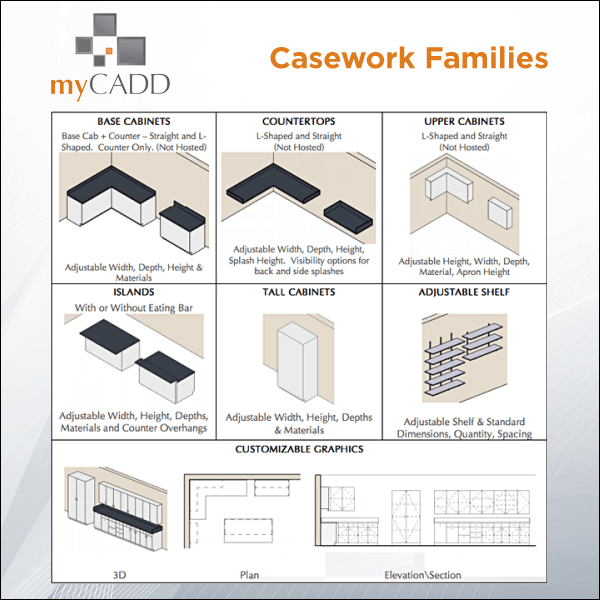 The myCADD Revit Family Library Pack is a collection of Revit families designed to provide the variety and flexibility which is missing from the default Autodesk libraries. They are flexible enough to meet your needs and designed to be easy to use. The six types shown to the left are included in the project: crown molding, base trim, and two different chair rail profiles with or without base trim. Profiles and heights can be edited the same as in any other railing family. Use these as a starting point for all your types. When the plan symbol is offset to the side ro from the wall through these parameters the offset does not show in elevation or 3D. Only the offset distance from the ground will show in all views. The outlet is not wall hosted, allowing it to exist with or without the wall (if a wall were to be deleted, or outlet exists in linked model, etc. ).